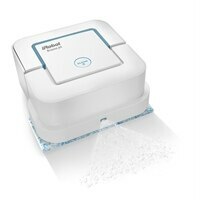 iRobot® Braava jet™ 240 Mopping RobotThe Braava jet™ Mopping Robot tackles dirt and stains in hard-to-reach places, like under kitchen cabinets and around toilets. Just attach a Braava jet™ Cleaning Pad and the robot automatically selects wet mopping, damp sweeping, or dry sweeping. Braava jet™ is designed to clean hard floors, including hardwood, tile, and stone. The Braava jet™ Mopping Robot tackles dirt and stains in hard-to-reach places, like under kitchen cabinets and around toilets. Just attach a Braava jet™ Cleaning Pad and the robot automatically selects wet mopping, damp sweeping, or dry sweeping. Braava jet™ is designed to clean hard floors, including hardwood, tile, and stone.